HOW TO MAKE BACON FLAVORED VODKA - No, I'm not joking! Image ©2010 by PopArtDiva.Com. All Rights Reserved. No permission is given to copy, share, distribute, reproduce, post or print without written authorization. A Fifth of Good Quality Vodka - Keep the Bottle! Fry your bacon crisp but don’t burn it. Chop it into pieces small enough to fit into your glass jar. Add your optional ingredients – making sure to trim, skin and clean where necessary. Shake gently, cap off the bottle and store in a cool, dark location. It's not necessary to refrigerate as the alcohol acts as an antibacterial pickling agent. Allow to sit for three weeks. When the “brewing” time is up place your jar in the refrigerator so the fat will float to the top and congeal. Remove the congealed fat with a fork or spoon it out. Place your funnel on the top of another mason jar, then place the coffee filters (2 or 3 together) into your large strainer and place this into your funnel. Pour the bacon infused vodka into the filter lined strainer/funnel set up right back into your original vodka bottle or a fun decorative bottle with a nice cap or cork. Voila! 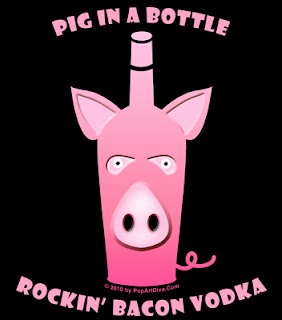 Now you have Pig in a Bottle!